Before the unrelenting deluge of reprints and translations of classical, conventionally-structured detective novels and short stories, I took regular trips down the trail of obscurity. During these excursions, I unearthed such little-known, but surprisingly good, titles as Lynton Blow's The Moth Murders (1931), Joseph B. Carr's The Man With Bated Breath (1934) and Franklyn Pell's Hangman's Hill (1946). So I wanted to return to these earlier days and present you with a truly obscure, long-forgotten mystery novel by a writer who's not even mentioned on the Golden Age of Detection Wiki – a veritable who's who of who the hell are these guys. Oh, boy, did I exhumed one that fits the bill to a tee. 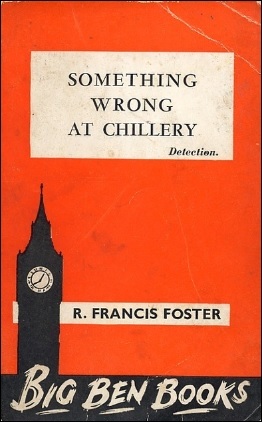 R. Francis Foster was a journalist and an author of books on the countryside, how-to-write manuals and penned a number of detective novels, short stories and serializations. 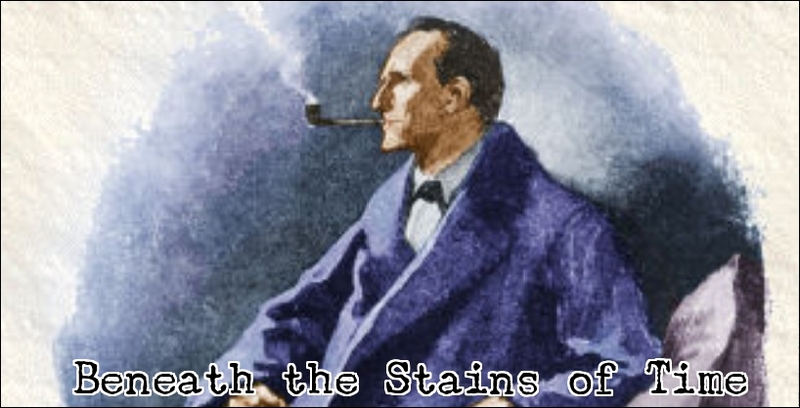 His serialized novels and short stories appeared in such publications as The Strand Magazine, Detective Fiction Weekly and Hutchinson's Mystery Story Magazine. Predictably, I would probably have remained unaware of Foster had it not been for the late Robert Adey's Locked Room Murders (1991), which listed one of his mystery novels. Something Wrong at Chillery (1931) constitutes the last recorded case of Foster's series-detective, Anthony Ravenhill, who's the "notorious crime reporter" of The Planet and has been published, during the 1930s, under two alternative titles – namely The Mystery at Chillery and The Chillery Court Mystery. Somehow, in spite of these alternative book-titles, my brain assumed the titular chillery referred to the cold storage of a distillery. No idea why. But you're allowed to point and laugh at me. The story begins with a restless Captain Trevor Hawkesbridge, late of his Majesty's Indian Army, who's time Indian has sharpened his "sense of danger." Captain Hawkesbridge has come to the conclusion that "anyone with half an eye can see there's something wrong" at Chillery Court. Chillery Court is the home of Hawkesbridge's old Commanding Officer in India, Colonel Merrow, who invited Hawkesbridge to come and stay with his family, but he has the distinct impression he had been summoned to help them on a very delicate matter. Hawkesbridge overheard a conversation in which Mrs. Merrow told her husband to "trust him" and "tell him the first thing in the morning." However, this is not the only reason for Hawkesbridge's apprehension. The daughter of Colonel Merrow, Osyth, had slipped out of the house and left a trail of footprints on the glistening, moonlit lawn. And, from his bedroom window, Hawkesbridge noticed "a second trail" across the lawn. Someone had been following Osyth! On the following morning, Hawkesbridge discovers a third trail with "the toemarks towards the house." There were two people about the previous night, but "only one returned." Hawkesbridge traced the trail of footprints to a hut and evidence suggests Osyth has stayed there for several hours, but refuses to believe she had a secret assignation with the unknown man. The problem takes a sinister turn when he return to Chillery Court. The North Sussex Argus has a "STOP PRESS" that "the body of a well-dressed young woman was found in a third-class compartment of the 10.35 train from Horsham to Brighton at Shoreham" and the unidentified victim had been strangled – which mortified Osyth when she read it. Hawkesbridge is convinced that the murder on the night-train is connected with the affairs at Chillery Court. And this murder brings Anthony Ravenhill to Chillery Village, because "a train murder's always good copy." In my opinion, the encounter and mental sparring match between Hawkesbridge and Ravenhill, as they compare their deductions on the footprints, is easily the best part of the book. This alone makes the book worth a read to everyone who dislike Hercule Poirot's dimwitted sidekick, Captain Arthur Hastings. Hawkesbridge is not a slow-witted dunce and can be pretty sharp, but he's bound by old-school conventions, breeding and loyalty to the Colonel. This is why he clashed with Ravenhill when they met. After a while, the story becomes complicated because the people involved either refuse to tell the whole story or are physically unable to do so. Somewhat of a problem when you're working with only a handful of characters. They're either murdered, attacked, physically collapse or lose their memory. A very convenient plot-device and you can put that down to the story being a tribute-act to the 1920s-style detective novels, which is most notable in the Indian material of the plot – such as Thuggi, dark yogi and the goddess of death, Kali. Nonetheless, there are some interesting bits and pieces of detection here. 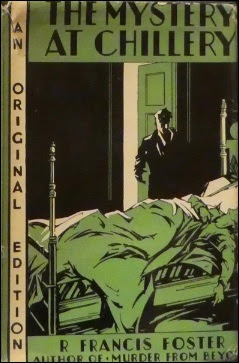 For example, this is only Golden Age mystery novel that actually uses "death spots" on the body to prove that the second victim had been murdered somewhere else. And later moved to the hut. Where the book becomes truly noteworthy, as a second-tier mystery novel, is the locked room murder, which is committed in one of the final chapters of the book. The house is tightly locked up with all of the windows securely shuttered and the doors locked and bolted. A precaution against the murderer. However, an unexpected and surprising victim is found murdered inside a locked bedroom and the solution is mindbogglingly simple, but where it draws it strength is that the explanation is also the final sentence of the book! A gimmick that Christianna Brand would use sixteen years later in one of her own impossible crime novels (Suddenly at His Residence, 1947). Only thing robbing this otherwise original ending of its surprise is that the murderer's identity had been obvious for a while. You can chalk that down to a lack of suspects. Something Wrong at Chillery is not a bad detective story at all, for a second-tier mystery, which even had some good and original ideas, but Foster missed the master's touch to make it fully work and he struck me as a poor man's Francis Vivian (i.e. a small cast of characters). On the upside, Adey considered this to be only "an average Foster novel." So, hopefully, this means The Lift Murder (1925), The Music Gallery Murder (1927) and Murder from Beyond (1931) are detective novels worth the trouble of tracking down. I just bought a used hardcover of this on Amazon. It sounds right up my alley. This was not bad for a second-string mystery and liked how the locked room was solved in the very last sentence of the book. Hope you like it! That was a lot of fun to read. You're quite right about the obviousness of the killer though. A pity Foster didn't work in at least one more suspect to be present for the big reveal. A chronic lack of viable suspects is the main weakness of the story, but glad to read you still enjoyed it. I assume you were very appreciative of the Christianna Brand-like ending with the solution to the locked room murder given in the last lines of the book. It was a great way to end, but what I really enjoyed was having an above-average Watson narrate the story. It made for some wonderful back and forth as they worked out the clues. I've gotten away from that element a bit in my second novel, and this obscure, little gem has inspired me to focus on that type of banter in my third. You mention Suddenly At His Residence giving the lat detail in the final line. London Particular does this better than any book I've read. The emotion in that final revelation gets me every time. It's not used by a clever detective solving the case, but by a broken man making a desperate plea. The moment is woven so deeply into the character. I only mentioned Suddenly At His Residence, because I wouldn't dare compare Something Wrong at Chillery with the masterpiece that's London Particular. You might like to know that my review of Goodnight Irene is scheduled for this upcoming Tuesday. And very much look forward to your second and third (locked room) mystery novels! That's fantastic! Can't wait to read it. Foster is notably written up in Gun in Cheek (maybe the sequel) for his "alternative mystery" style of writing and plotting. I had three of his books decades ago, sold them all. I attempted to read Murder from Beyond but was so bored out of my mind I gave up. So do try to find that one and read it to the end and tell me I was a dope for never finishing. ;^) I skimmed this review and read the paragraph about Kali and that was enough to get me to have another go at Foster. So I went to buy a nice copy using my usual bookselling website sources, but had to try three times! Looks like you're taking up an accidental referral business that I used to specialize in. You've just managed to sell four copies of this obscure title, including the one with the DJ that you used to illustrate your post! "I attempted to read Murder from Beyond but was so bored out of my mind I gave up. So do try to find that one and read it to the end and tell me I was a dope for never finishing. ;^)"
Normally, we tend to agree on this stuff, but, after our slight disagreement today, all bets are off. So you're on! "You've just managed to sell four copies of this obscure title, including the one with the DJ that you used to illustrate your post!" Just spreading the good word. I wonder how often this happens when one of us posts a review of an obscure mystery. I talked about this author a bit in my book Clues and Corpses.